The 2008 Honda CRF250r for sale has dual mufflers, full fmf exhaust, Excel racing rims and all-new plastics and graphics. This is not a ragged out, used Honda dirt bike. 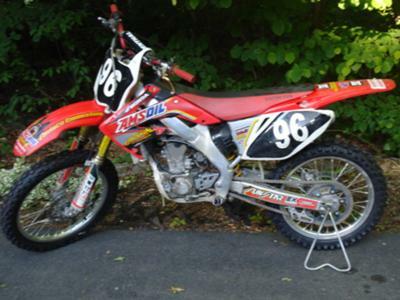 The 2008 CRF250r for sale is very clean and well maintained. If you would like to voice any opinions or write a review of the used dirt bike for sale, you may use the comments form below this ad to do so. Thanks for visiting GoGoCycles Used Dirt Bikes for Sale and for taking a look at my 2008 Honda CRF250r for Sale. My location is Shelton near New Haven and in my opinion my asking price is cheap enough that it can't be beat on Craigslist or in an Ebay auction; $3500 or you are welcome to send me your best offer in an e-mail using the comments form provided by GoGoCycles. Could you possibly take it for $800 and where are you located I probably might buy this please lets arrange something. can you send to mauritius?